Meet the new EPA administrator, Scott Pruitt, who opposes the EPA. No amount of concern that Scott Pruitt is too friendly with the fossil fuel industry, that he has improperly withheld 3,000 emails about his business dealings with coal, oil and natural gas companies; that he has said climate change is a hoax; that hundreds of rank-and-file EPA employees oppose him; that he is blithely unaware of pollution’s harm to the public health; and that he holds in contempt the very agency he was nominated to lead: none of this swayed the majority of the U.S. Senate in approving him to lead the EPA. The Senate confirmed Pruitt, currently the Oklahoma Attorney General, as the new EPA administrator today at 1 p.m. Both North Carolina Sens. Richard Burr and Thom Tillis voted for Pruitt. Sen. Susan Collins, a Republican from Maine, voted against his nomination. However, her nay vote was canceled out by two Democrats, Sen. Joe Manchin, a West Virginia, and Heidi Heitkamp of North Dakota. They are interested in reviving their states’ coal industries, which is unlikely, given the market forces favoring natural gas and renewables. 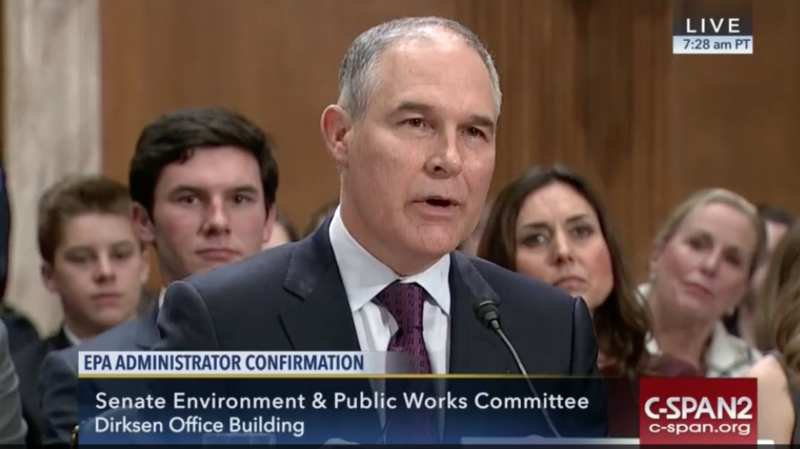 Pruitt was grilled last month by the Senate Environment and Public Works Committee, where Republicans ultimately voted to send his nomination to the full Senate. Democrats boycotted the vote. Yesterday, a state judge in Oklahoma ordered Pruitt to release thousands of emails related to his dealings with fossil fuel companies. Those emails are public under open records law, but Pruitt had withheld them for two years. Now that Pruitt has been confirmed, it will be interesting to see what changes — in personnel, in rulemaking and in public information — he will enact. Since President Trump took office, there has been a hiring freeze at the agency, as well as a halt on public information. The main EPA website hasn’t changed — except for a scrubbing of the climate change section — and no social media posts or press releases have been issued. Next, the Senate can turn its attention to approving a deputy EPA administrator. Former NCDEQ Secretary Donald van der Vaart is one of two finalists for that job.